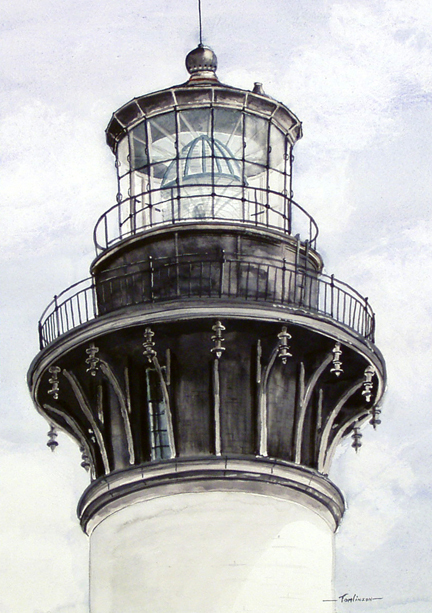 Jack P. Tomlinson is an artist of Lancaster County, Pennsylvania, who primarily paints local Lancaster area landscapes, lighthouses, train stations and Victorian architecture. The artist studied watercolor basics with a local water artist. He then developed his own unique style and spent the past 30 years refining his technique. He is primarily self-taught in the watercolor medium. His realistic style and attention to detail benefits from his earlier training in other media. A watercolor painting begins with multiple layers of washes that develop the main body of the particular subject. He then meticulously adds extensive dry brush detail work to bring out the details and textures of the image he is trying to produce. He will focus his attention to detail in the shadow areas of a work, as well as the highlight areas. His paintings are done in his studio with the help of photos, or sketches and he will sometimes visit the site of his subject several times to study the details he wants to capture. His pleasing landscapes reflect a personal element that the artist incorporates into each completed work. The artist is an associate member of the National Watercolor Society, the Pennsylvania Watercolor Society and the Village Art Association of Lititz, Pa. Copyright © 2002-2010 Jack P.Tomlinson All rights reserved.